Machete scabbards is another point of authenticity for the Vietnam reenactor / collector. 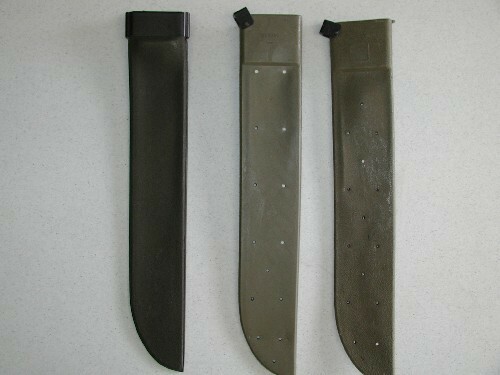 There are three types of scabbards from the Vietnam war that I am aware of. The first is the "WWII Style" with a heavy, dark OD rubber body and a metal collar at the top stamped "US". The latest example of this style that I have is dated 1966. In 1967, a new model was introduced that looks almost exactly like the "modern" carrier you can buy today. It has the swivel attachment and built in sharpener. The difference is that the finish on the body is smooth and not textured. The example below is 67' dated. Finally there is the "modern" carrier made by Marmac that is current military contract. It is exactly the same as the 68' dated carrier below. 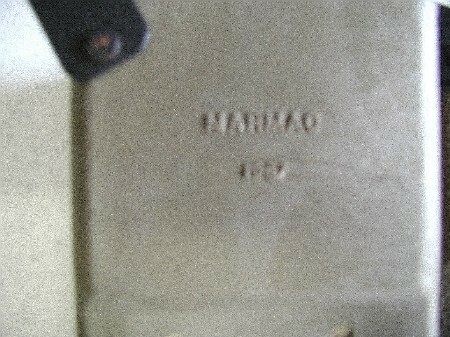 The only difference is that it says "1968" beneath Marmac instead of "2002". The example below is dated 68 and has all of the features, color, texture of the new ones. So for reenacting, if you obscure the date or hang it from your rucksack through the pocket where it can't be read, it will look identical. How do you know when a machete was made? The easiest way for Ontario Knife Co. Machetes (the most prevalent manufacturer), is the location of the stampings on the bade. Holding the machete in your hand with the blade tip facing up, all have "US" stamped straight across. Vietnam Era Machetes then have the "Ontario" stampings running perpendicular to the "US" while current manufacture have the "US" and "Ontario" running parallel. * note, the purpose of this section is to provide a quick visual reference, not an in-depth history. The M-14 was the natural progression of the M1 Garand. The M-14 was used in the mid sixties with some of the first Army units that deployed to Vietnam. The XM-16E1 quickly replaced it in Army use as a line infantry weapon (it continued on in sniper roles evolving into the XM21), but the US Marine Corps continued to issue the rifle for another 2 years. The first M-16 was issued on an Air Force contract and had several distinctive features. The most obvious is the lack of a forward assist. Other features included a solid buttstock (no trap-door), triangle handguards, three-prong flash suppressor, standard contour "pencil" barrel and straight pistol grip (no finger groove). There were several improvements made in the M-16A1 Rifle over the course of it's use. 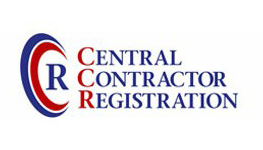 There seems to be much confusion on the subject, so we will attempt to address some of the most common. While it is true that the M-16A1 was officially introduced in 1967, the US Army did not issue the "straight" M-16 to line infantry units. The First Cav was sent to Vietnam in 1965 with the "experimental" XM-16E1 which had the addition of the tear drop forward assist. This is important to note when putting together a rifle for your impression as a forward assist will be more correct. 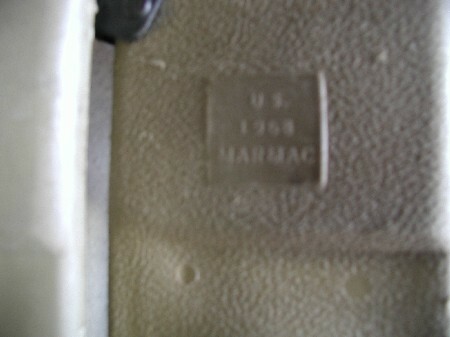 The primary difference from the XM-16E1 from the M-16A1 was the addition of a chrome bore. The three prong flash hider was changed to a full birdcage later based on the fact that the three prong was prone to snagging. 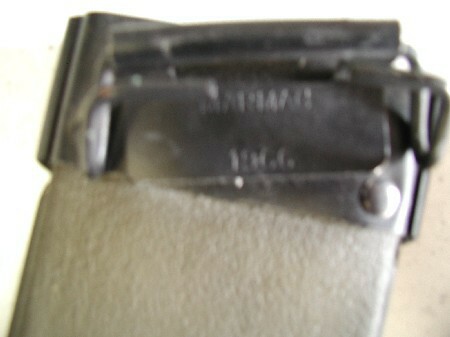 The M-16A1 also incorporated "fencing" on the lower receiver around the magazine release button. Another late 60's addition was a buttstock that incorporated a trap door to hold the cleaning rod. This addition was in conjunction with the 4 piece cleaning rod as the 3 piece rod made through 67' / early 68' was too long to fit in the stock. The CAR-15 Commando was the first attempt at making a compact version of the M-16 (see first two photos). It was quite simply a "chopped" down rifle consisting of a 10" barrel with shortened triangular handguards and a first generation non-vented "moderator". In addition the collapsible stock was based on the design of the full size buttstock. The project was refined leading to the XM-177 Series (3rd Photo). The rifle was essentially an M-16A1 with a re-designed two position collapsible aluminum stock and shortened upper receiver. The XM-177 (third and fourth pictures) featured a 10.5" barrel with a 4" moderator while the XM-17E2 (fifth picture) introduced in 67' featured an 11.5" barrel with a 4" moderator. ATF has ruled these moderators as suppressors, but it is important to note that the moderator is not a true suppressor in the classical "Hollywood" sense. It was not designed to make the rifle inaudible, it was designed to reduce the "bark" of a short barrel to that of a standard M-16A1 while also providing more control for the short barreled weapon. All of the grenade launchers fielded by the US military in Vietnam were 40mm, single shot launchers. The M-79 Grenade Launcher (1st. Photo) saw use throughout the entire Vietnam War and was never fully replaced by the "over and under" systems mounted in conjunction with the M16 series of rifles. The first of the combination systems was the XM-148 (second photo) which was designed in 1965 and began issue in 1966. The XM-148 had several flaws, the most of glaring of which was the complication of its use and the fragility of its cocking and firing arms. The XM-148 was replaced in 1969 by the XM-203 (not pictured) which was adopted as standard in 1970 as the M-203 Grenade Launcher. By the late 1960's the US Army had formalized the XM-21 Sniper System. The system was based on the M-14 Rifle in conjunction with the AR-TEL range-finding scope (based on the Redfield 3x-9x). In 1966 the Marine Corps adopted the M40 Sniper Rifle System to replace the Winchester Model 70. The system was built around a Remington M700 Short Action in 7.62 and fitted with a green anodized Redfield 3x-9x Accu-Range Scope.